Guys...this salad. This salad! I keep making it because honestly it's like a restaurant-quality salad but you can make it at home in about 10 minutes. 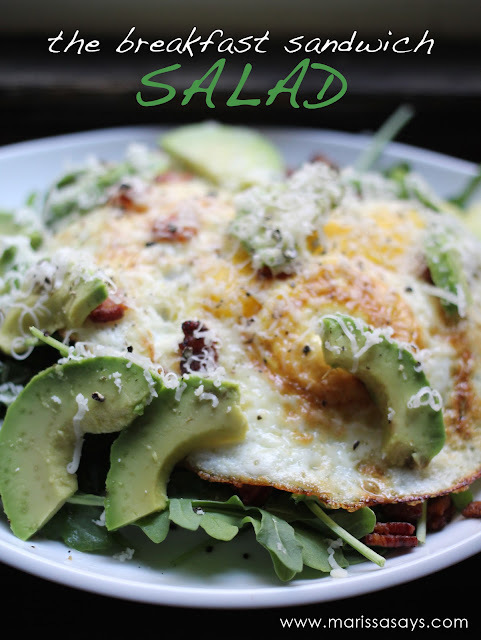 Do you see it, semi-runny egg yolk, melty cheese, perfectly ripe avocado, crispy chunks of bacon and then under all of that deliciousness is the some fresh peppery arugula dressed every so slightly with the tangy juice from a lemon. Yum yum gimme some. Get the full recipe below. Crisp up your bacon chunks in a nonstick pan over medium heat, drain on a paper towel when done. Place the arugula on a plate, squeeze a little bit of the lemon juice over top. Add butter/oil to a frying pan and bring the pan to medium heat. Add eggs to the frying pan, flip when firm and slightly crisp at edges, continue to cook until whites are firm but the yolks are still slightly runny, remove pan from heat. Sprinkle half of your avocado slices and half of your cooked bacon over top of the arugula. Place the cooked eggs on top of the arugula and add the remaining avocado and bacon on top. Sprinkle grated cheese over the whole thing and squeeze the remainder of the lemon wedge over your egg.